I'm now three months into another go at Keto, and this time sticking to it much better. It seems that I can remain in ketosis on 40g carbs or more, and the occasional day of completely different food (I had a pizza!!) still didn't kick me out of ketosis. So I allow myself a cake or two per week, but otherwise stick to under 40g net carbs per day. For the first two months I tracked everything on Cronometer, now I have reset my food portion sizes through experience, I am no longer tracking. In the three months I have lost 14kg and am feeling really good with it. As before, at first I had a few issues with my digestion and felt rather bunged up. I assume this is the change of gut bacteria from carb-eating to veg&fat eating. All the pipework functions properly now, although I do add some flax seeds to my lunchtime salad to help things along. We eat so many vegetables that I guess I am getting plenty of fibre. Now, after 3 months, the only remaining negative is that my hair seems thinner and lank. I hope it will bouffant out a bit in due course. I do 16:8 fasting every day, in other words I don't eat breakfast, just lunch and dinner. This is totally easy as I am not hungry in the morning. I now also walk to work and back one day a week (4.2km each way), just to mix up the exercise a bit. The dog is also getting walked daily (I didn't used to do this as my landlady does) and of course cycling. My partner is doing much less strict low carb. He eats the same meals as me at home but has some other stuff over the day, including his weakness, Gummibärchen. He is also losing weight but doesn't really need to drop any more, so I am trying to get him to eat more mascarpone desserts etc to up his fats/calories. We will do bike tours again this year, at least 3, and on those we have to eat normal food really. I hope to be able to stick with the Keto most of the rest of the time though, as I feel so much better for it. Losing weight is a real bonus of course, and I have another 17kg to go to get to my target weight (which is still 10kg higher than it should be! ), but I hope slow and steady will do this. This time round I have also stopped bothering trying to make nice Keto cakes; I have a decent Brownie recipe but most of the other stuff just doesn't taste good enough for me. Fortunately my sweet tooth has pretty much disappeared, so I don't need anything like that at home. The occasional proper German cake when on a cycle ride is a great treat, but I could live without if necessary. Really should get back on this WOE again. Been back on the road for work for the last 18 months and snacking on chocolate and garage food has took me back up to around the 100kg mark. Still not eating pasta rice or potatoes with dinner but as the youngest has also moved in with us there's more chocolate bars, pork pies and sausage rolls in the fridge. 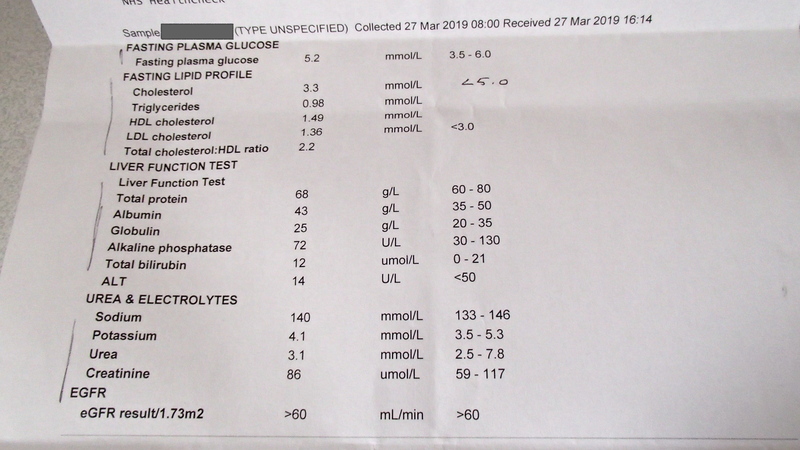 I thought I'd post my recent NHS health check blood test since other blood results have been reported on this thread. The answer to Fad or Phenom though is eat what you want if you enjoy it.